Identity theft has escalated from a rare nuisance just a few years ago to an all-too-possible nightmare that can involve weeks of time to resolve. As a result, there is a growing need for identity theft protection services that proactively monitor a wide variety of information sources. Download this practical comparison guide to learn what are challenges exist and the key benefits for businesses to look for in selecting a partner. 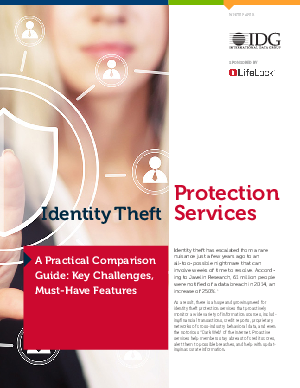 See how ID Theft Protection Services stack up and which one is right for you and your company.